Ocean-inspired Villa Anucara presents fresh white exteriors that echo the white-capped waves rolling onto Cemagi beach just 150 metres away. 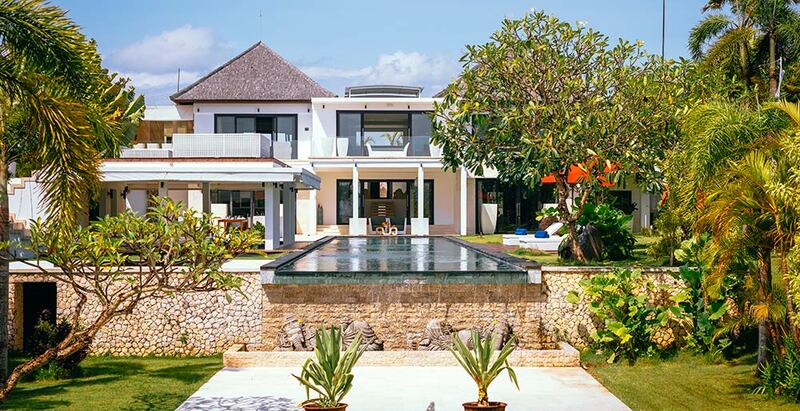 This pale palette also characterises the huge garden planted with snowy frangipani blossoms and sweetly scented jasmine and featuring a sunken poolside lounge and 35-metre swimming pool. Inside, white-furnishings are accented with splashes of blue and turquoise and tasteful time-worn artefacts. Five ensuite bedrooms include two masters with ocean views and three guest rooms in seculded garden pavilions. A full team of staff is on hand to look after every need with butler service and superb home cooking.